Saving money to pay for college is a daunting proposition even if you’re reasonably well off financially. With tuition increases continuing to outpace the overall inflation rate year after year, parents may be hard pressed to come up with all of the funds needed to finance a child’s higher education. But financial aid could help fill the gap. Each year, more than 13 million undergraduate and graduate students get some form of financial assistance. But the federal government and universities won’t simply hand you the money. To determine whether you qualify for financial aid, you must complete and file the Free Application for Federal Student Aid (FAFSA). Who should fill out a FAFSA? Practically everyone. Even if you don’t think you’ll qualify for financial aid, there’s no harm in trying because the filing is free. And even students from the wealthiest families may need to submit a FAFSA if they’re going to be in a work-study program. But just because you should file a FAFSA doesn’t mean you won’t be intimidated by the process itself. Although the form has been simplified somewhat in recent years, it still can be challenging. Don’t hesitate to seek our assistance. Virtually every college admission program requires a FAFSA for financial aid purposes. While a school may ask for other financial information in addition to that sought in the FAFSA, the basis form is pretty much mandatory. And so you’ll have to come up with answers to about 130 questions about your family assets and income. 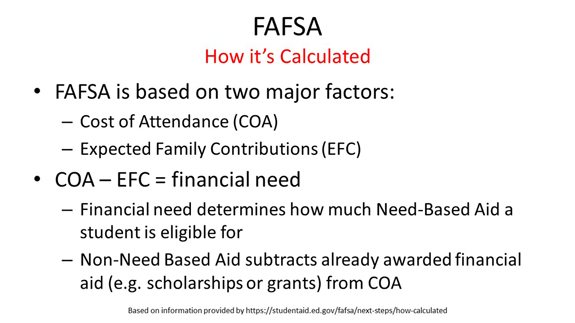 Based on the information you provide, the FAFSA administrators will calculate the "expected family contribution" (EFC) for your family. How many people are in your household, your family income, the number of students in college, and most assets (but not retirement funds) will be factored in. Where can you find the FAFSA? It’s available online all year long at www.fafsa.ed.gov. Starting with the 2017-18 school year, you can file it as early as October 1 of the prior year (for example, October 1, 2017 for someone starting school on September 1, 2018). Be sure to file the form as early as possible because financial aid often is awarded on a first-come, first-served basis. Late filers may miss the bus and receive nothing. The EFC is the amount your family is expected to contribute to your student's college education for one year. The lower the EFC, the larger the financial aid award that your student may receive. Sometimes the EFC rules can work in your favor. If your student is admitted to a school that agrees to meet students’ full financial needs, the EFC lets you know the most you’ll have to pay regardless of how much that college costs. Suppose that a family's EFC is $25,000 and the student is applying to a school with a total cost of $35,000 a year. That family might expect to receive up to $10,000 in financial aid. What if the college costs $50,000? The financial aid award could be as high as $25,000. The basic equation to remember is: Cost - EFC = Need. Filing a FAFSA is a necessary evil for those seeking financial aid for college. We can help you position your family for the best possible result.